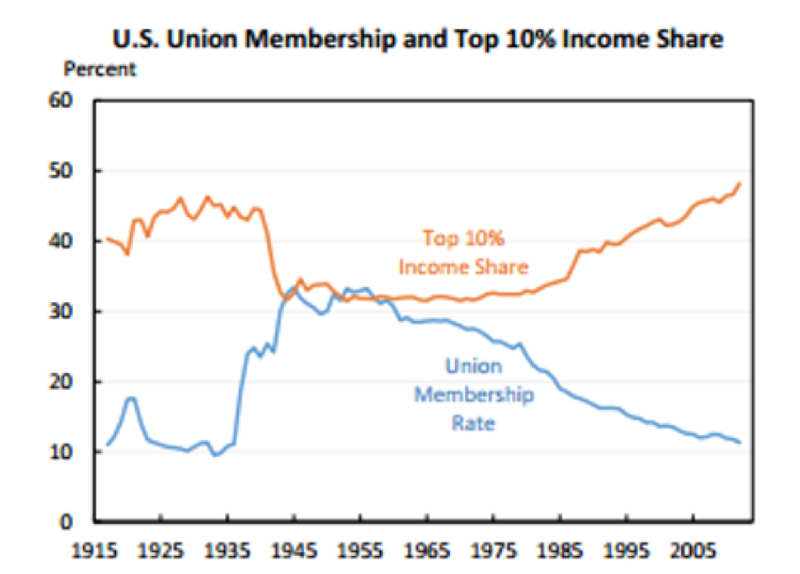 Jared Bernstein and I just published a comprehensive PowerPoint presentation on inequality in the United States (available for download here). This presentation is first and foremost intended as a resource. Part 1 of the presentation documents the increase in inequality over the past 35 years; the trend is evident from every major data set and income definition. Inequality deniers have fortunately become a rapidly-dwindling breed, but should you encounter one, Part 1 should help set the record straight. Part 2 discusses why inequality matters. As we summarize on our slides, inequality “reduces opportunities, undermines the democratic process, distributes growth unevenly, and may even have negative macroeconomic effects.” We provide the mechanisms behind these reasons and evidence documenting them as well. The slide notes contain a more in-depth look at these issues, as they do throughout the presentation, for anyone interested. Fortunately, increasing inequality is not inevitable; it is “a problem that better policies can directly address.” Part 3 of our presentation explores some of these policies, measures that can begin to address inequality’s causes and counter its effects. While our slides in this section are in no way exhaustive, they’re a good starting point for the type of comprehensive social justice agenda I’ve mentioned previously. 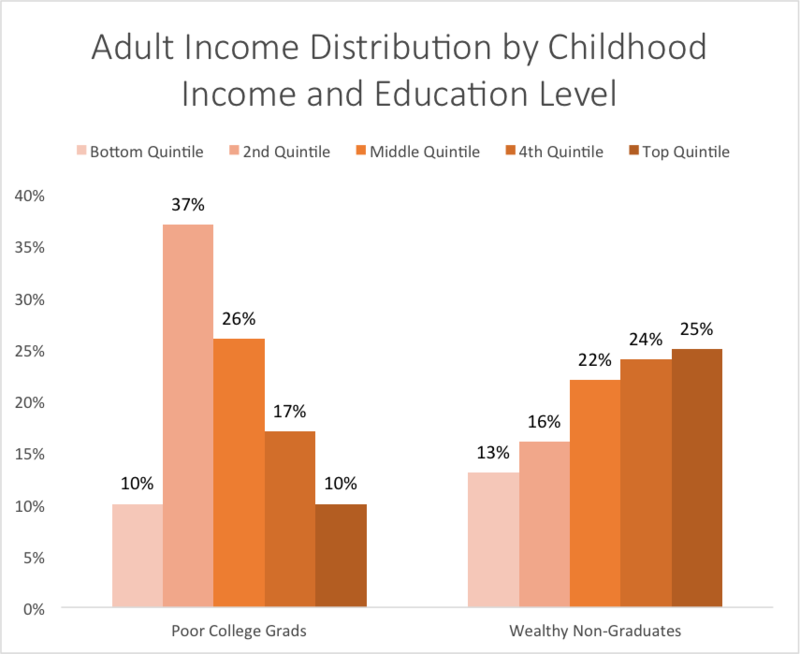 This chart uses data from the Pew Economic Mobility Project to compare adult economic outcomes for two different types of students: students who grow up in the bottom income quintile but manage to graduate college (“poor college grads”) and students who grow up in the top income quintile but don’t make it through college (“wealthy non-graduates”). Wealthy non-graduates (49%) are almost twice as likely as poor college graduates (27%) to end up in one of the top two income quintiles as adults. As we discuss in our presentation, inequality presents a variety of education-specific obstacles for low-income students, and addressing these obstacles (and thus facilitating college completion) is an important part of our agenda. At the same time, the less favorable distribution for low-income college graduates shown above provides a critical reminder of the importance of a comprehensive social justice agenda. If we truly want to provide low-income students with opportunities equivalent to those of their higher-income peers, we need strategies that address the needs of low-income families, strategies that address some of the direct effects of growing up disadvantaged. That means we must get the economy back to full employment. It means we need a strengthened safety net, higher labor standards, and a reversal of the decline in unionization. It also means we need better-regulated markets and improved fiscal policy. A push for quality education can’t have its intended effect unless it’s part of this larger agenda. Jared and I hope that this presentation, by documenting inequality’s rise and consequences, provides a compelling basis for these claims. While the historically high level of inequality represents a serious threat to fundamental American values – opportunity, democracy, and broadly shared prosperity – we believe we can combat this problem if we acknowledge it and work together on solutions.